Mustafa Mohatarem, General Motors chief economist: "Things are very, very positive." TRAVERSE CITY, Mich. -- Economists continue to be bullish on the North American auto industry, despite a slow-growing economy, forecasting record production and a surge in sales in the next few years. In an annual roundtable on the state of the industry, a panel of six economists from automakers and consulting firms forecast a full recovery from pre-recession levels by 2016 and an expansion by 2020. They differed somewhat on the pace and the drivers of the expansion, but overall described a North American industry that will see increasing volumes and that is building better quality vehicles which last longer. Still, they see problems, especially in demand from younger buyers who are having trouble finding jobs and from a supply base that is reticent to invest, given its recent history. Sean McAlinden, chief economist for the Center for Automotive Research, places the annual sales rate, or SAAR, for 2013 at 15.4 million in the U.S., climbing steadily to 15.9 million in 2016 and 16 million in 2017. "It's probably premature to say we're leveling off," McAlinden said. Though the percentage of those aged 18 to 34 who are getting drivers' licenses has declined sharply, younger people have not lost their interest in automobiles. Instead, they are having difficulty affording vehicles in the face of ballooning student loan debt, rising insurance and fuel costs, says G. Mustafa Mohatarem, chief economist for General Motors Co.
Mohatarem says that, despite the climb in the SAAR from its low of 2009, the recovery still is not complete. "We are not even back to trend. Things are very, very positive," Mohatarem argues. 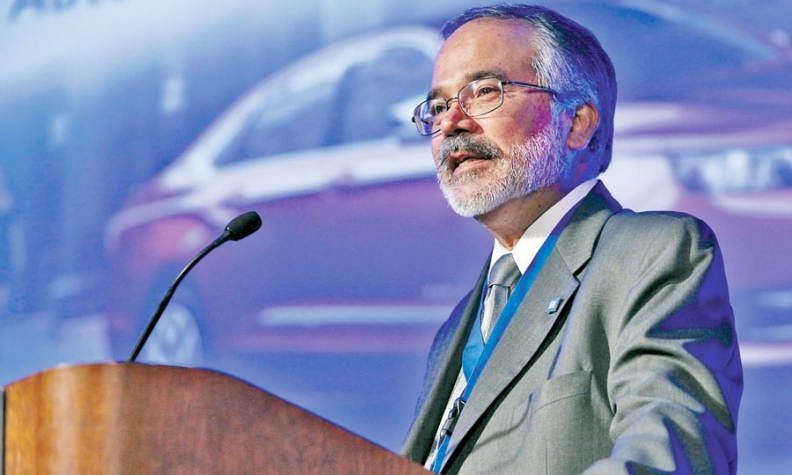 Anthony Pratt, director of forecasting for the Americas for research firm Polk, said that automakers will have a record number of new or significantly reworked vehicles over the next three years, further driving demand for new automobiles. Leasing has returned to 19.9 percent of new registrations, the highest level in five years, and 72 percent of loan originations are for 60 months or longer, easing pricing pressure on automakers. Global demand for automobiles will cross 100 million in 2018, driven mostly by growing markets in Asia and South America, said Mike Jackson, director of automotive forecasting for IHS Automotive. Growth in exports from North America to other markets will push outputs to five years of record levels above 17.2 million, beginning in 2016. The growth will be concentrated in mid-sized, compact, subcompact and mini segments and take advantage of global platforms. Gasoline-powered vehicles will remain dominant for the next two decades as improved efficiency and transmissions power mileage gains, says Mike Omotoso, senior global powertrain forecaster for LMC Automotive. Gasoline will lose some market share to light-duty diesel, but electric vehicles will remain a niche market at less than 3 percent of total sales through at least 2025. Meanwhile, gains in build quality and technology offerings are changing the way consumers shop for cars. "Quality is becoming less of a consideration, because quality is up across the board," Omotoso said.